My wife and I were in northern California recently. I was there for a conference in San Francisco and we decided to have a little vacation and see the redwoods. We went north to Eureka and spent a few days touring. The redwoods are amazing and so are the coastlines. Eureka is the northern end of the defunct North Coast Railroad and there are several Geeps rusting away in Eureka. I think the closest engine was a GP7 and the rest are GP9s. We spent a few days in and around Eureka and then headed down to Napa. I wanted to see the ex CN FPA4s on the Napa Valley Wine Train. As it happens, we caught up to the Wine Train as it was heading back to Napa. It does not go very fast so we were able to leapfrog it a few times. I tried to include the surrounding scenery with the Wine Train. Fortunately there were quite a few vineyards. NVRR 71 and 70 were the power. I took one video of the train going by. I did go visit the shops later that evening to see the other engines. I stored the photos here in a gallery and recorded some information about the Wine Train on my web site. One Sunday morning (March 9) I decided to go spend a couple of hours railfanning here in Winnipeg. Nothing was going on and it was a reasonably nice day to get out of the house after a long winter. I did a little tour of the Symington yard area and saw a few trains - nothing special - then went around the Perimeter Highway toward home. As I crossed the CP Emerson subdivision, I saw a headlight to the north, indicating a southbound train. I hear these trains from my house, but it's rare that I actually photograph one. Sadly I live too far away to see tracks from my front steps! I had to photograph this one. I headed south on St. Anne's Road and then cut back to the tracks on Prairie Grove Road. There's a crossing there, but I figured I had time to get on the other side of the Floodway to shoot the train with the the bridge. I kept going on Prairie Grove to highway 75, then a quick jaunt south got me to winding Hallama Drive, on the south side of the Floodway. 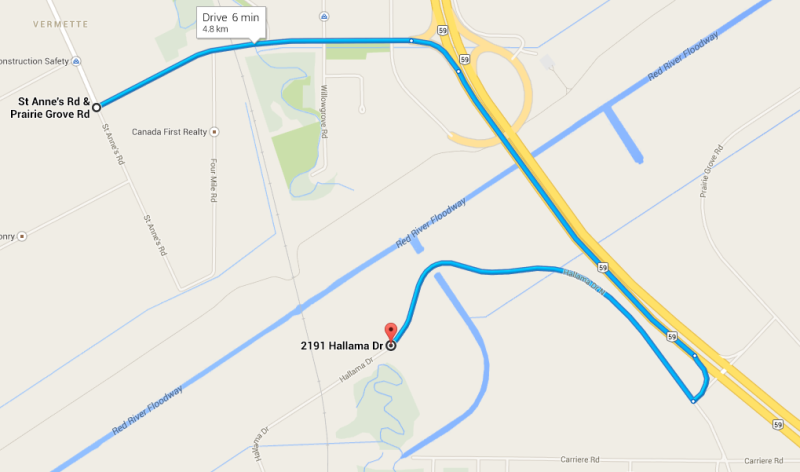 The problem with Hallama Drive is that there is nowhere to park when there is lots of snow on the ground. I pulled over as much as I could, put the 4-way flashers on, and nobody came along... except the train. As it pulled out of the trees and into view, I was amazed to see a CP SD40-2 leading two CSX engines. It made a fine sight crossing the desolate snow-covered landscape. They were not going very fast, so I took quite a few photos. I thought I might be able to get ahead of them relatively quickly, so I headed south down highway 75. The CP track diverges fairly sharply from 75 right away, so I wasn't hopeful for a quick catch, but I figured I could go all the way to Niverville if necessary. I took the opportunity to photograph CP 6029, CSX 442 and CSX 861. Once they were done clearing the switch, they lined it for the siding and slowly crawled forward. I took a few snaps and then took video from the crossing. I hope they had a good trip! I mentioned in a previous post that I saw a BNSF engine on the Canadian side of the border at Emerson, Manitoba, and that BNSF has started running power through into Manitoba. I'm going to talk a bit more about that now. BNSF Manitoba services a number of industries in Winnipeg. One of their major industries is the Paterson elevator at Lilyfield, at the northwest corner of Winnipeg, off Inkster Boulevard. I mentioned this before. Here's a Google Map view of the area. The "racetrack" in the middle is the loop track serving the concrete Paterson elevator. It is reachable by CN from mile 11.0 of the Oak Point subdivision (shared with the nearby Prairie Dog Central at this point) and by CP from mile 8.3 of the Carberry subdivision. The odd thing is that BNSF Manitoba has the contract to serve the elevator. What has happened in the past is that CN brings the traffic up to the Fort Rouge yard on CN 533, then either CN takes it from there to Lilyfield using running rights over CP, or BNSF Manitoba takes it from Fort Rouge to hand off to CP who takes it the rest of the way. What is happening now is that BNSF is occasionally running unit grain trains with their locomotives on the train to Noyes, Minnesota. There it is picked up by CN crews and run up the CN Letellier subdivison as CN 533, onto the CN Rivers subdivision/CN Reddit subdivision to Symington Yard. There the engines are put on the other end and it proceeds to the Paddington interchange in St. Boniface onto CP track, through the CP yard and the CP Carberry subdivision to the CN Oak Point subdivision. It is run by CN crews in Manitoba the entire way. Thanks to Mark Perry for the information. On Saturday I was heading west on the Bishop Grandin Boulevard when I spotted a train (CN 533) heading slowly north on the CN Letellier subdivision. I took Pembina Highway north to try to get ahead of the train. I went all the way up to Portage Junction before I spotted the power - 4 BNSF engines! A quick exit onto Jubilee to Osborne did the trick, and I was able to get to the area near the new rapid transit bus station before they did. After less than a minute, BNSF 7630 led the parade. The engineer was kind enough to open his window to stick his arm out and give me a wave. I appreciate that! Next was BNSF 5498. I saw this unit in Grand Forks back in 2010. The third engine was BNSF 1007, with graffiti on the side. It's very rare to see an operating engine with graffiti. Bringing up the rear of the consist was BNSF 4856. You can see the bus station to the right. TaylorOver9001 filmed the same train just south of Portage Junction. A BNSF unit train was first spotted on February 4 (photo in Morris, Manitoba). Another BNSF engine was spotted on February 12 just outside Winnipeg. I understand there is a possibility that BNSF Winnipeg crews could be operating these unit trains in the future. In December 2013 the Canadian Transportation Agency ruled on an application for interswitching by Richardson International for their Red River South elevator outside Letellier, MB, based on a 1912 agreement between the Midland Railway and the Canadian Northern, predecessors to BNSF Manitoba and CN respectively. CN was ordered to interswitch traffic for the elevator at Emerson. I don't fully understand the ramifications except that interswitching rates are regulated and are lower than commercial rates, so CN would be paid less. CN has appealed. I would love to read the details of the 1912 agreement. The CTA ruling has some interesting quotes which seem to imply that BNSF could haul directly from the Red River South elevator into North Dakota but could not do local switching along the route, nor bring traffic from that elevator to Winnipeg. Maybe it's good that I am not a lawyer.